Jake Lucash, is a 10 year old sassy ball of energy with a heart of gold! 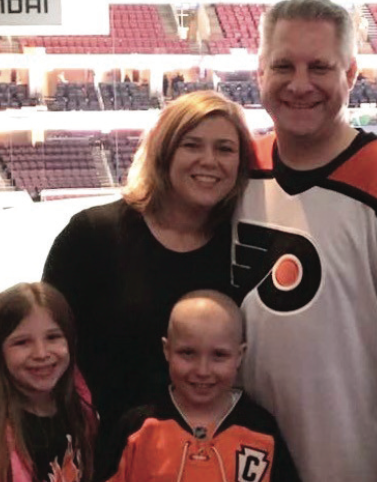 If anyone has had the pleasure to know Jake Lucash, knows his vivacious personality and his absolute love for sports from his beloved Eagles to the Flyers, there is not too much Jake couldn’t tell you about professional sports. Jake himself plays football, basketball, soccer and baseball and all the coaches that have had the pleasure to coach Jake will tell you no one plays with more heart and passion than Jake Lucash. What you may not know is that all his life Jake has been battling Cystic Fibrosis and Juvenile Rheumatoid Arthritis. So if the grueling daily breathing treatments and extended hospital stays to treat his Cystic Fibrosis were not enough for the family, mom Mary Lucash and dad Luke Lucash had to make a tough decision to treat Jake’s Rheumatoid Arthritis with a medication that suppresses his immune system to prevent him from going blind. He is currently in remission of Anaplastic Large Cell Lymphoma, which is a rare type of non-Hodgkin’s lymphoma. Mary and Luke continue to be the strong remarkable people they are however, Mary has left her job to take care of Jake during his treatment, which will absolutely put an additional financial strain on the family. Jake attacked and beat cancer. Now, he brings the same heart and passion he has for the game to his other battles, showing such strength through it all. You can be sure little sister Morgan (7) will be his constant cheerleader! Please continue to check back to monitor Jake’s progress and thank you for supporting all the families of Homers for Hope!